H. Edward Roberts died this week at age 68. If you don't know the story of how Roberts helped launch the personal computing revolution, let us fill you in. Back in 1970, Ed Roberts had just finished serving at the Air Force Weapons Laboratory designing circuits for missiles. Along with a close friend, Forrest M. Mims III, he decided to open a business from his garage selling build-it-yourself electronics kits to hobbyists. The new company, MITS, sold its first product, the MITS 816 calculator, in 1971 for $175 ($275 assembled). The calculator was featured in publications such as Popular Electronics and proved a commercial hit. Several more models followed, and to keep up with demand MITS moved to a new building with an assembly line and commercial soldering equipment. Then disaster struck -- Texas Instruments in 1972 developed its own chip and began selling calculators at half the price of the MITS models, fully assembled. Even with $250,000 in debt and a collapsing business, Ed. Roberts didn't waver from his commitment to personal computing. He persevered building the prototype of the first personal computer, the Altair 8800, named unofficially after a planet visited in the Star Trek episode Amok Time. The Altair 8800 saved the company. Ed. Roberts had brokered a deal with Intel to buy Intel 8080 chips in bulk for $75/chip (normally they were $360/chip). The cheap CPUs allowed the Altair 8800 to retail for $439 ($621 assembled) at the time when Intel's Intellec-8 Microprocessor Development System, another Intel 8080 based system, sold for $10,000. The cheap Altair 8800 not only proved a mild commercial hit, but it helped launch the world's biggest electronics company today, Microsoft. 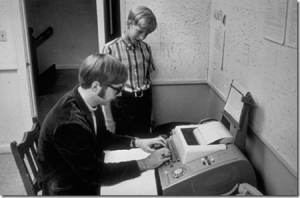 In 1975 Bill Gates and Paul Allen, students at Harvard at the time read about the Altair. They contacted Ed. Roberts telling him they were developing a programming language interpreter and asking if he was interested in purchasing in it. The statement was a lie. The pair had no interpreter in the works. But when Mr. Roberts expressed interest they rented computer time and hurriedly threw together the first version of BASIC, which fit on 4 kB of tape and supported floating point math. They flew to Albuquerque, New Mexico to demonstrate the program to Ed. Roberts. The first version only printed "Altair Basic" and then crashed. However, a second tape worked, printing Gates and Allen's company's new name "Micro-soft" and running a short integer addition program. 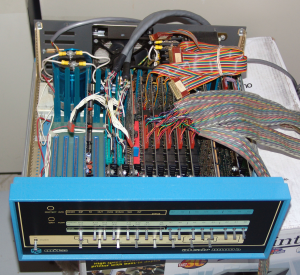 In mid 1976, the Altair 8800B launched and Gates and Allen delivered 8K Altair Basic. Then came the feud between Gates and Roberts which landed in the courts. The case centered around Microsoft beginning to develop for the Motorola 6800 and other devices, which MITS argued was contractually forbidden. Gates countered that Roberts had not paid them in full and that the contract had no such stipulations. Recalls Roberts, "[Gates was] a very bright kid, but he was a constant headache at MITS. You couldn’t reason with him. He did things his way or not at all." The case would be settled in 1980s in Microsoft's favor. However, by then Roberts had long since left the computer industry behind. In 1977 he sold the MITS company, which then had 230 employees for $6M USD. He kept $2M USD of that sum and used it to purchase a farm in Georgia, which he moved to with his wife and five sons. The 6'4" former Air Force officer turned computer pioneer turned farmer worked the land for a few years, then decided to pursue his childhood dream of becoming a physician. He succeeded at obtaining that degree. In 1986 he was awarded a medical degree from Mercer University in Macon and soon after opened a practice in Cochran, 35 miles away. The later years found Roberts in turbulent times, with two divorces and two new marriages, starting with a divorce in 1988. 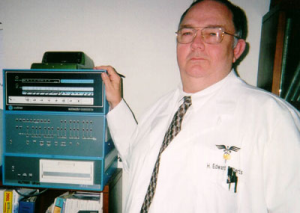 Roberts found strength and fulfillment in his medical career. While he continued to tinker with electronics, he turned his back on Silicon Valley, reportedly still hurt by the dispute with Microsoft. But as Roberts lay deathly ill in the hospital this year, retired Microsoft co-founder Bill Gates reached out, spending much time with his former employer-turned-nemesis. Last Thursday Roberts passed away. He is survived by his third wife Rosa Roberts, his five sons, and his daughter he had in 1983. His role in launching the electronics industry -- and Microsoft -- will not be forgotten by those who know its story.